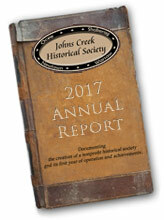 The Johns Creek Historical Society is a 501(c)3 community organization formed in 2016 and incorporated as a nonprofit in January 2017. Our interests are discovering, preserving, and sharing the history of the land and earlier inhabitants of the area that is now the City of Johns Creek, Georgia. In addition to research projects and regular meetings, there are opportunities to explore history in the area with trips to local cemeteries, history sites, museums, and to archival resource centers. In January, 2017, the Historical Society was incorporated as a non-profit in the state of Georgia. The Historical Society has 501(c)3 status and is classified as a public charity by the IRS. Contributions made to our organization are tax-deductible to the extent allowed by the IRS.